One of our most popular gifts, these attractive chopsticks are fun, stylish, and useful and won't be soon forgotten! Makes a great housewarming, wedding, or anniversary gift, or simply anyone who deserves a memorable gift with a special message. Two pairs of silver-handled chopsticks with rests. Complimentary engraving on silver-plated handles. Gift arrives presentation-ready in a hand-wrapped gift box. A free card with your personal message is included with your gift. Free Chopstick Engraving! One line on each chopstick of up to 18 characters. Enter information to be engraved using the personalization option during checkout. Measures 12" x 10" x 2". Engraved Chopsticks for Two is a hand delivered gift. These gifts are delivered by one of our local design centers located throughout the United States and Canada. Same day delivery is available for most gifts when ordered before the cutoff time. The cutoff time for Engraved Chopsticks for Two is 2 PM in the recipient's time zone. Silver polished-metal handles engraved with your personal message. Gift includes two pairs of chopsticks with rests. Arrives presentation-ready with hand-wrapped gift box. The engraved chopsticks were wrapped nicely for gifting. Very Happy with promptness of order and delivery. I am over the moon with the chopsticks. The quality was superb! My daughter who the gift was for, was very pleased. Ordering was easy and delivery was spot on. I was kept up to date with delivery,which arrived at time stated. Will definitely use again. I was a little nervous because of the price but when I received them the quality was great. Everyone I showed them to loved them and said they wanted to buy some for a gift. I would highly recommend them. I was most impressed with the speed with which the gift arrived. It was a day early. Also when I opened the gift it looked as good as the presentation pictures in the advertisement. I would have no trouble using GiftTree in the future. Ordered these for family for Christmas. They loved them and liked that they were engraved. I ordered these for a wedding shower gift. They turned out great! The only reason I didn't give a 5 star is the font is a little small. This is no fault of the product its just the size that they are. They seem very high quality and they shipped super quick! Style, quality, class! Exquisitely packaged and ready to present! Spouse is Japanese and loved them as her Birthday Gift! She loves these sturdy and well crafted chopsticks so much that she is only going to display them - perfectly fine for me as I'm not adept at using them myself however they are ready to use as everyday chopsticks but I think they are way too nice to use daily. The polished silver is elegant and engraving added that extra special touch! 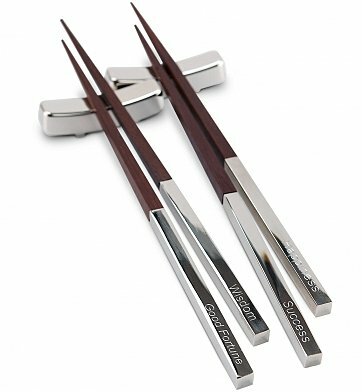 I give these chopsticks and myself 5-Stars - the sticks for being an absolutely beautiful gift to gift anyway for any occasion; and myself for choosing this very nice and appropriate gift for my wife! The gift was warmly received by my friends. The presentation (wrapping, card) was classy and everything I had hoped it would be. This is the third item I have purchased from GiftTree after I received a gift for my birthday. I have not been disappointed yet. I can't wait to give them as a housewarming gift. I saw these in June and purchased them as a Christmas gift. Had them engraved with the recipient's name. They arrived in just a few days, nicely wrapped, but of course I had to open to inspect them. I'm very pleased! The gift box is nice and sturdy and I expect it will be a good place to store them to avoid scratching the silver. And the silver is pristine -- no scratches, buff marks, pitting. I'm very impressed and I'm sure my granddaughter will be pleased with her gift. This is my first purchase from GiftTree, but I'm sure it won't be my last. We ordered these chopsticks for our son and his fiance as an engagement gift and they said that they are so nice they will only use them on special occasions! This gift was purchased for a friend overseas and arrived earlier than the scheduled date, which was handy seeing as I left it to the last minute. Great service as they were able to make a change to my message over email. Tracked the entire purchase process so I was confident with delivery. My friend loved it. I bought this gift for my boyfriends birthday, he's Chinese and we use our fair share of chopsticks, he described these as so beautiful he thinks that they should be on a wall and never used. The balance of the wood and silver is exquisite, the chopsticks are a bit weighty but this makes them look and appear very expensive. The engraving was done well. It isn't too light. Just loved these for a gift for some dear friends of ours. My only problem was I had their names engraved on them. which was very nice, but I actually thought the words that were engraved on the picture would also be on them, but they weren't. My mistake. All in all the gift was very beautiful. The chop sticks were very nice. It is a special gift that is nice to receive. For those that entertain or enjoy Asian food. I bought this for my boyfriend's birthday. We have been dating only a couple of months but have very interesting dates and memories. One of which was eating Chinese with chopstick while staying up watching scary movies. The next day we had left overs but no chopsticks. So how appropriate was this gift! Not only that, but each can be engraved so I engraved each one with a special memory of a past date. Alligator Hunting, Snook Catching, Beach Dining, and of course, Fantasy Football. Also, there is a card that is included so I put a sweet message about how many memories we have already had together and looking forward to many more. He absolutely LOVED it and said it was the most thoughtful gift he had ever received! I highly recommend this to anyone who is having difficulty coming up with a gift idea. I ordered two sets of engraved chopsticks as a gift for my daughter and son in law. They called upon receipt to say how beautiful and thoughtful the gift was BUT one chopstick was broken! I called customer service and was told that a new pair would be shipped as soon as the engraving was done. It arrived two days later. THAT IS GREAT CUSTOMER SERVICE. THAT IS THE WAY YOU OPERATE A COMPANY AND INSURE REPEAT BUSINESS. THANK YOU GIFTTREE!!!! I bought this gift for a friend and thought the quality and uniqueness was great. The only reason why I gave it 4 stars is because on I the handles was loose and came off. For daily use and special occasions. Very special sentiment. Loved by all. BUT...it did arrive 2 days later than anticipated? Great gift idea, the recipient absolutely loved it. The chopsticks represented a bit of traditional and modern for their fifth year anniversary. I bought these for my husband for an anniversary gift. They arrived very promptly, which I was very pleased :D The 2 pairs of chopsticks and their rests (I was so focused on the chopsticks I didn't know they came with rests at all) were a delight to see once the box was opened. The metal ends are a significant weight, but aren't difficult to work with, the rests are also of the same metal. Beautifully engraved and polished, my hubby said that they're too nice to eat from! Haha The wood ends right where it meets with the metal, which is not a plating over the chopsticks; but their own solid piece, which explains the weight, while the wood is just as solid and smooth. I very happy with the service of GiftTree, and of course, my purchase! Arrived on time, wrapped nicely and well received. Very attractive, elegant looking, including the presentation box. Perfect gift idea for daughter's fifth anniversary, when wood is the symbolic gift. The personalization makes it extra special. I received these quickly (a last-minute Valentine's Day gift and they arrived on time, 4 days I think). They are beautiful. Nice and heavy, so they feel classy, not cheap. The personalized engraving made them even more special. Great gift for wedding, anniversary for couples who like asian food and/or decor! I thought the chopsticks where really nice. Nicely packaged and shipped very fast. The only hangup I had was the writing on the chopsticks was very light. You could barely read it. These customized chopsticks are great for decoration and occasional use. (I say occasional to preserve the beauty of these great sticks and prevent lot of washing or water contact). Look good both on the dining table or over the fireplace or anywhere where one can flaunt them with the names / message engraved and etched on the chopsticks. I love these majestic and royal looking chopsticks and recommend them to anyone as a great gift. These are beautiful and make a great gift. 4 stars as they would be even better if all four sides of each one could be engraved. Chopsticks came out looking great. Fast customization and delivery. The chop sticks were awesome. They came in well wrapped with a bow and in a little box that serves almost as a case. It was a xmas gift that went over very very well. I am happy to say that the chance taken (buying online without seeing the actual product in person) paid off. Just as other reviews said, these arrived quickly, and nicely packaged. The quality is very good, also I'd like to add: first - I did find the engraving to be quite visible, (some reviews had led me to think it would be hard to see) and it is an extremely precise & clean/clear etching as well! Second - It should be noted that the color of the metal is more of a 'gun metal' than silver, which in my opinion adds richness. The finish is very polished/glossy. Nice!!! Our kids loved the chopsticks. The only comment I have is that the engraving might have been a little more pronounced. Other than that, what a special way to tell them we love them. but one of four chopstick is bent a little. And engraving is easy to read, but top of capitalized letters was little cut off. Recipient thought it was very pretty, though. I just want to get the bent one fixed since it will be hard to use a bent chopstick. I purchased this as a present for my boyfriend and he absolutely loved them. They arrived earlier than scheduled and were wrapped beautifully. The engraved Chopsticks that I bought for our 5th anniversary were packaged and wrapped beautifully. The chopsticks and silver have a really nice weight to them too. Not at all flimsy. The only small disappointment was the engraving was not very deep and a little hard to read. Still happy to have them. I really liked the look of these, they are a gift so have not used them myself.